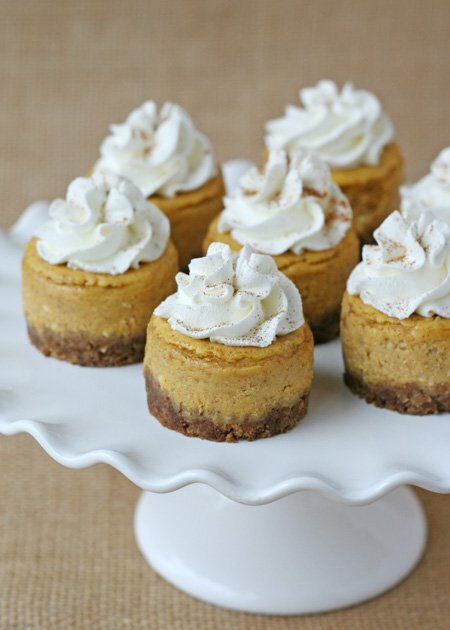 This delicious Pumpkin Cheesecake recipe is creamy, flavorful and perfectly spiced! I recently spent a few days with a good friend who loves cheesecake. In fact it’s entirely possible that over a four day trip we ate at The Cheesecake Factory three times! I came home from the visit inspired to try some new cheesecake recipes. I thought pumpkin would be a fitting flavor to try first. The recipe yielded a rich and delicious, lightly spiced cheesecake that would be the perfect addition to any holiday dessert menu. I made 12 mini cheesecakes using a mini cheesecake pan (I found mine at Home Goods, but they are easily available on-line from Amazon or Sur la Table). The mini cheesecakes may be a tiny bit of extra work to deal with initially, but once baked and cooled, they make a perfect small serving, with no cutting needed. 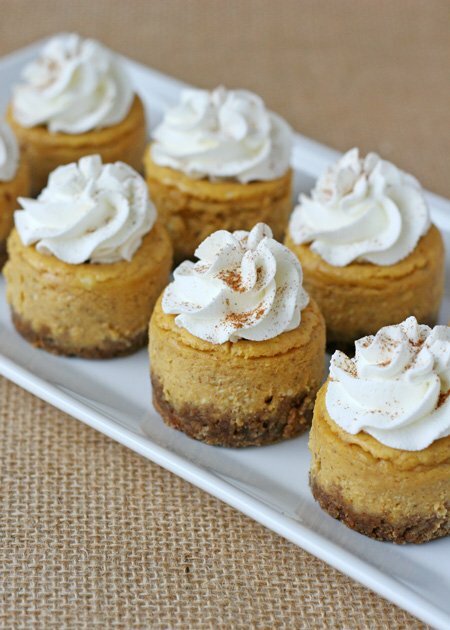 This delicious mini pumpkin cheesecake recipe can also be made into one large cheesecake. This cheesecake can be made as minis (as pictured) or as a full sized cheesecake, with equally delicious results. The proportions for 12 mini cheesecakes are listed first, with the ingredients for a full sized cheesecake below. Prepare crust by combining crust ingredients in a small bowl. Mix to combine with a fork. Add one rounded tablespoon of moist crust crumbs into each mini cheesecake space. Use a small bottle (such as a spice bottle, or a shot glass) to press down the crumbs, to form a crust. Beat the cream cheese until smooth. Add pumpkin, eggs, sour cream, sugar and spices. Blend until combined. Add flour and vanilla, and beat until well combined. Pour filling into prepared crusts. Divide batter amoung the 12 spaces. Bake mini cheesecakes in pre-heated oven for 20 minutes. Remove from oven and cool about 15 minutes. Cover lightly with plastic wrap and refrigerate for 2 hours minimum. For a large (9") Cheesecake- Follow general directions above. Press crust into the botom of a 9" springform pan. Prepare filling (as listed above). Bake cheesecake 1 hour. Cool 15 minutes, then cover with plastic wrap and refrigerate 4 hours before serving. The cheesecake can be stored in the refrigerator up to 2 days. Top finished cheesecakes with freshly whipped cream. This is a perfect dessert for the busy holiday season. The cheesecake can be made up to 2 days ahead of time, and stored in the refrigerator. Top your chilled pumpkin cheesecake with fresh whipped cream and a dash of cinnamon for a delicious and festive treat. i just made these last night for our weekly family dinners – and they were DELICIOUS. i just used regular sized muffin pans…and just doubled the recipe. i usually look at the comments below before trying out new recipes but i just went for it and so glad i did. thank you for the yummy recipe, i have this page as a favorite now. You doubled the bake time as well ? So 40mins? 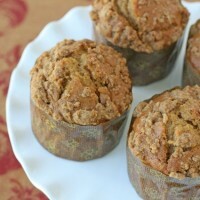 Oh YUM — never mind some fancy pan, I made these in a muffin tin too (with cupcake holders) and they are PERFECT. Might be my favourite new pumpkin dessert! 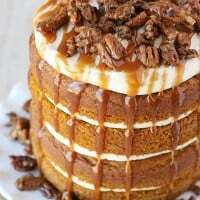 I especially love the portions — usually paying $5 for two packages of cream cheese to make a cheesecake turns me right off the whole process, so a recipe that only calls for 1 package is a very nice treat Plus I’m pretty sure 12 pumpkin cheesecakes is still more than enough for just my husband and I!! One note — I forgot to even spray the cupcake holders, and the cheesecakes still popped out no problem. I also added 1/2 tsp of ginger to the mix, just because I like a bit of spice to my pumpkin. I’ll definitely make this recipe again! Just made this recipe and I LOVE them! So so good! I also made them in a mini muffin/cupcake tin, with liners, and I have to transport them so leaving them in the liners work perfectly. I also wanted to mention that with the mini muffin tins, I made the recipe as listed, but I had WAY more leftover cheesecake filling, so I made more crust and ended up with almost two dozen! I think this is really nice because when you are making mini anything, more is always better!! Is this self rising flour or all purpose? What a great recipe! I made mine low-fat by using neufchatel cheese instead of cream cheese. And, I used non-fat Greek yogurt instead of sour cream. And, I used Trader Joe’s toasted coconut cookie thins instead of graham crackers. It was still decadent! Thank you for sharing this delicious recipe! If you bake them in a mini muffin pan (silicone), how long is the baking time?? And has anyone baked them in a sheet pan and cut into squares with success, and how long would that baking time be? Unfortunately, I am not good at transposing baking times! I just finished baking 2 dozen and I have them in the fridge chilling! The filling is sooo good! Can’t wait till their chilled and I can add whipped cream! Thx for the recipe! It’s def a keeper! I just made them for my friend birthday and it was a big success, thank you for the recipe! 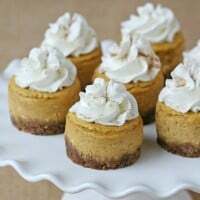 I made these mini cheesecakes for Thanksgiving yesterday. I can’t stop eating them!! Best desserts I’ve ever made! I’m a huge fan of pumpkin cheesecake and I’d say these are right up there with Cheescake Factory!!! Thank you for sharing this recipe!! For anyone wanting a review of these cheesecakes: they are amazing! 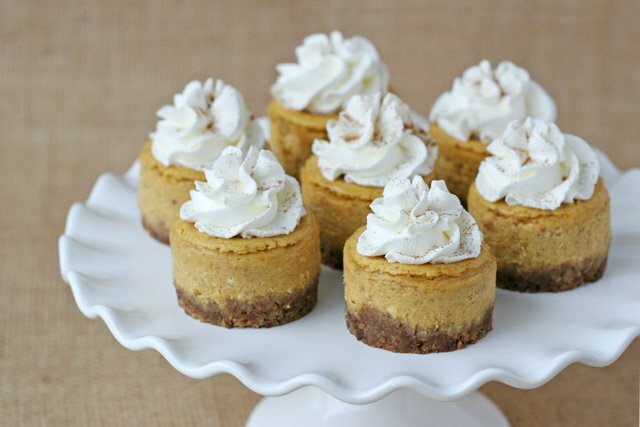 I have been searching for mini pumpkin cheesecakes for my upcoming Autumn Cocktail Party and have tried various recipes, but this one was the best. So yummy and perfect. My only comment would be that I would not suggest using a regular muffin pan like I did. They stuck to the bottom & sides. I even sprayed with Pam! I did not want the ridges of the muffin liners so that I why I went without, but I think that would work. Instead, I just picked up a Norpro nonstick mini cheesecake pan from Amazon in which the bottoms pop up for ease of removal. 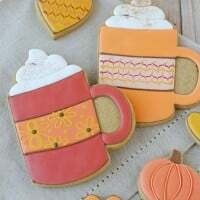 Can’t wait to serve these to my guests! Thanks for this recipe. I made these for r my book club a few days ago. They weee great! Thanks for sharing it with us. I accidentally combined all the filling ingredients at once..whoops. Will this still turn out ok?? Yes, they should be just fine. The only reason to beat the cream cheese first is to ensure it is smooth. It’s harder to get the cream cheese perfectly smooth once everything else is added. Enjoy! The dessert is a keeper! Thanks for sharing! I have made these about 10 times and they are ALWAYS gone immediately! 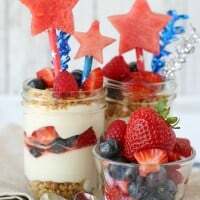 Is there any way to modify the recipe, so they be plain cheese cake so you can top them with pretty fruit? Can you freeze them, without the whip cream? I’m wondering if you tried to freeze these? I would like to pre bake these for an event and was hoping they would be ok once thawed. Yes. I freeze mini cheesecakes all the time for events and they turn out perfect. Can’t tell they were ever frozen. Just freeze them without any toppings. For the mini cheesecakes the amount is 1/2 cup plus 1 tablespoon of canned pumpkin puree, I think you might have just overlooked it in the recipe above. Happy baking! How long should I bake cheesecakes if I make them in a standard cupcake pan with liners? Looks wonderful! Can I make ahead and freeze? If so, how long would you need to thaw as cupcakes? And any changes to the recipe if I don’t include the crust? Thank you! I have not ever frozen these, so I’m not sure what to recommend. They will remain fresh in the fridge (in a seal container to avoid absorbing odors) for a couple days. If you do not plan on including a crust, I’d worry a bit about getting them out of the pan, so keep that in mind. Also, the crust takes up some of the room in each container, so plan that you’ll get less total cheesecakes. Feel free to experiment! I’m sorry if this was already answered, but does this recipe double well? I’m so excited to make these, but I think I’ll need more than 12….thank you!! Yes, feel free to double it, I think it will work out just fine. Happy baking! Does this call for whole cloves or ground? These were absolutely perfect! The perfect amount of seasoning was added! I really loved this recipe. My crust fell apart even after being refrigerated for 2 hours. Any suggestions? Has anyone actually froze them with good results. Would like to do a week ahead and freeze. I have not frozen them, and I’d be hesitant to do so. The cheesecake can last in the fridge for up to 3 days (well covered from any smells in the fridge), so that does give you a bit of time to prep other foods. I do totally understand that cookies around the holidays gets a bit crazy! Happy baking! Yes. I’ve been freezing mini cheesecakes for years and they turn out perfect. Just don’t freeze them with toppings. Do you need to grease the mini cheesecake pan? No, you do not need to grease the pans (as long as you are using a non-stick mini cheesecake pan, as listed). As the cheesecakes back it will pull away from the edges on its own. And when the cheesecakes are fully cooled, simply press up on the removable bottom of each mini cavity to release each cheesecake. Happy baking! When do remove them from the mini pan? After the full cooling period (2 hours or more). Simply press up on the removable bottoms of each pan cavity to release each mini cheesecake. Happy baking!